Painting your kitchen cabinets is a big job! Make sure to give yourself enough time to get the job done. Painting your kitchen cabinetry is a great way to update your kitchen without breaking the bank. However, too many people rush into this DIY project without taking the proper preparatory steps, leaving them with a lackluster finished product. Here are our tips for painting your kitchen cabinetry so that you will have a beautiful and professional-looking kitchen. There are some home projects that can easily be done over a weekend. However, repainting your kitchen cabinetry requires at least four to seven days to do well. 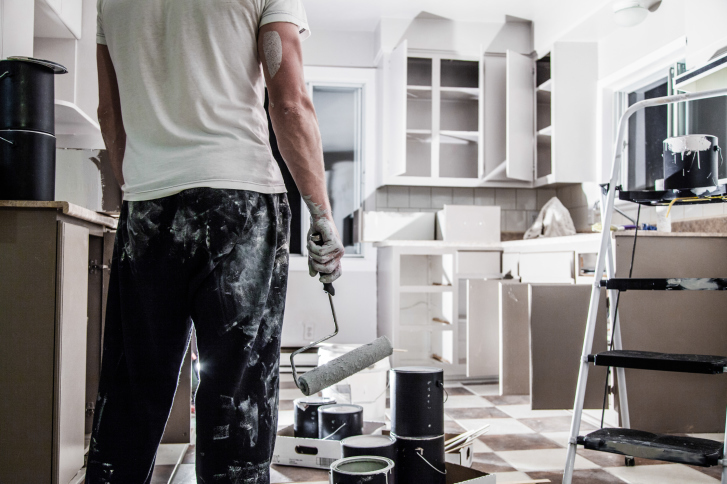 Especially if you’ve never repainted cabinetry or furniture before, you should allot yourself enough time to do the job without feeling rushed. You’ve picked the perfect paint color, but don’t get too excited yet! You have to clean your cabinetry before smoothing on your new color. Even if you keep an uber-clean kitchen, it’s a good idea to wipe your cabinetry down with a grease remover. If you don’t take this important step, then when you paint on your water-based paint, it won’t stick to the grease-coated wood. You can use a paint-prep degreaser, like TSP, to achieve a clean finished product. It’s also worth noting that you should also dust your cabinetry as well. Dust on the wood can leave a grainy texture in the paint. Once your cabinetry is totally clean, you’re ready to begin painting. Remove Doors and Drawers, and Label! Take the time to remove all the doors and drawers of your cabinetry. While removing these pieces, make sure to label them so you know how to replace them back to their original positions. Many homeowners choose to not remove their doors and drawers and instead paint over everything, including the hardware. This approach will begin to chip and look old almost immediately. If you put the time and effort into doing a thorough job, you’re sure to see the effects of your efforts for many years to come. Do you need some great Benjamin Moore paint to get started on your painting projects in Howard County this fall? Columbia Paint Company is your one-stop shop for all of your home-decorating needs. From fabulous Hunter Douglass window treatments to beautiful Benjamin Moore paint products, we have everything you need to make your dream home design a reality. Schedule an appointment with one of our design consultants today! Don’t forget to check us out on Facebook, Twitter, Pinterest, and Google+ for more updates, information, and tips!